Image courtesy of Sharon Stevens. A focussed, determined and confident Western Wolves turned up to their Round 12 outing against the UTS Shamrocks on Saturday at Trumper Park. The last time the two teams met, the Shamrocks won by four-points. This time there was a massive turnaround with the Wolves walking away 54-point winners. The Wolves’ confidence was high following two solid performances over the past two rounds. 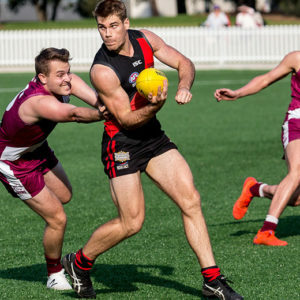 In Round 10 they surprised many when they knocked over the Sydney University Bombers and in Round 11 the team lost very narrowly to the Southern Power. Their determination extended into Round 12 and it was obvious from the first bounce that they were out to make a statement. The tackling pressure from the side was outstanding. I counted ten tackles that lead to holding the balls across the match, including two in the space of two minutes from midfielder Amelia Causley-Todd. Their defensive pressure was so intense that they were able to even stop the Shamrock’s Gillian Behan who has been tearing sides apart with her speed. Behan did her signature ‘play on whilst her opponents set up’, however the Wolves were onto it and Behan found herself running into a wall of blue and white. It was an even contribution across the field for the Wolves. Star midfielder Melissa Freckleton had great support from Causley-Todd and Cassandra Emery. 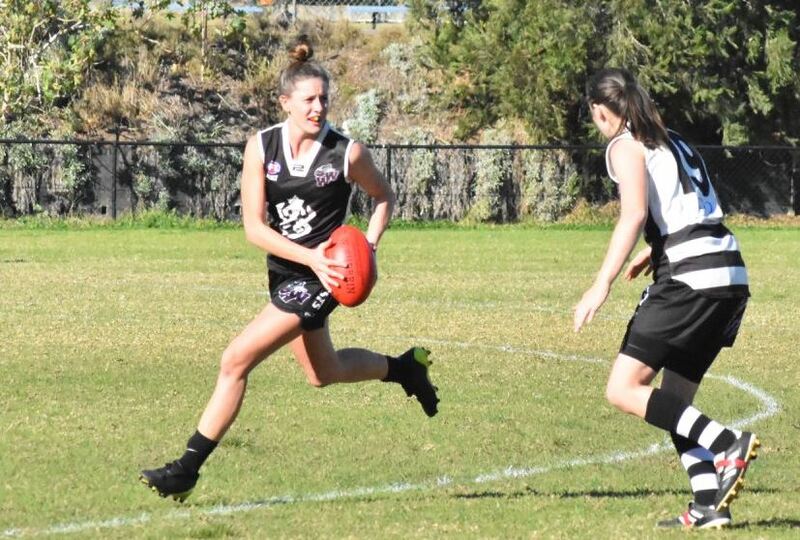 In the forward line Nikki Furlong and Tracy Rantall were strong targets, however it was Michaela Eckman who was the standout kicking three goals. 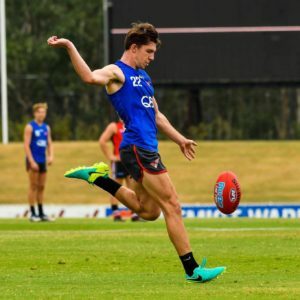 Eckman showed her footy smarts kicking the three goals from three different scenarios – one from a set shot, one from a snap on the run and one from sitting in the right spot front-and-centre for the crumb. For me, the most notably improved player is Rebecca Miller. 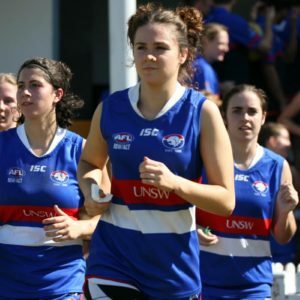 Having watched her game against the UNSW Bulldogs in Round 9 where she was named best on ground, she has already taken her game to another level just three weeks later. Her confidence was soaring on the weekend. Miller took multiple marks across the ground, especially at the top of her forward 50 where she was set up to defend the Shamrocks attempts to exit out of danger. She competed all day in the ruck and I loved watching her take on players, dodging and weaving like a rover. Her day was topped off when she kicked a goal in the final quarter. Miller intercepted a mark, played on, tucked the ball under her arm and snapped on goal. Her teammates loved it. If she continues to improve at this rate, I worry for the teams facing her in the upcoming rounds! The only area the Wolves could look to improve was on their accuracy in front of goal. In the first quarter they kicked one goal seven. By the end of the match they had added to that tally kicking 15-points in total. These potential goals would have provided vital percentage points to their position on the ladder, especially heading into the latter stages of the season. Eckman says that it’s all starting to come together for the Wolves after the club and its players set their goals and expectations at the start of the season. Eckman explained that the change of culture has mainly been driven by the club’s co-coaches Arron Convery and Leigh Urquhart, but that the message has been reiterated by the team’s leadership group. Eckman has kicked seven goals in the past three rounds, but modestly explains that this is due to the hard work of her teammates. Around the grounds, Macquarie’s eleven game unbeaten run has finally come to an end at the hands of the Auburn-Penrith Giants. In a low scoring affair, the Giants (1.2.8) defeated the Warriors (0.2.2) by 6-points. Southern Power (4.7.31) defeated the Newtown Breakaways (2.3.15) and UNSW (3.6.24) defeated the Sydney university Bombers (2.1.13) by 11-points. 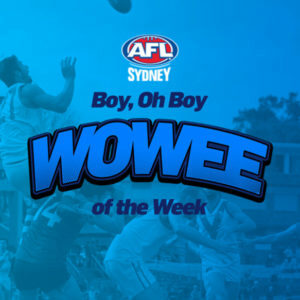 lMen's Premier Division MOTW: Can Wolves win away from the Den?